The Sling Bookshelf For Kids is an attractive storage solution to display your kids favorite books. The canvas bookshelf holds books with cover forward making it easy for kids choose their books themselves. The childrens bookcases are compact and convenient for small spaces. Perfect for the young reader,the different bookshelf designs, presented here , give you choices to match your child's room theme. Featured Here : Primary Sling Bookshelf from amazon. 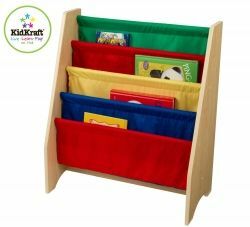 The kidkraft sling bookcase has canvas book sling in primary colors that adds cheer to your child's room.The size of the Sling Bookshelf makes it easier for young children to access. The sturdy wooden bookcase from Tot Tutors with 5 nylon fabric pockets in bright red, blue, green, and yellow helps your toddler choose their books easily for enjoying their reading time.The compact height of the sling bookshelves also encourages them to return their books back to their place. Primary colors are bright colors that attract our children's attention first. They can then choose their favorite books kept at a height that is just right for them. 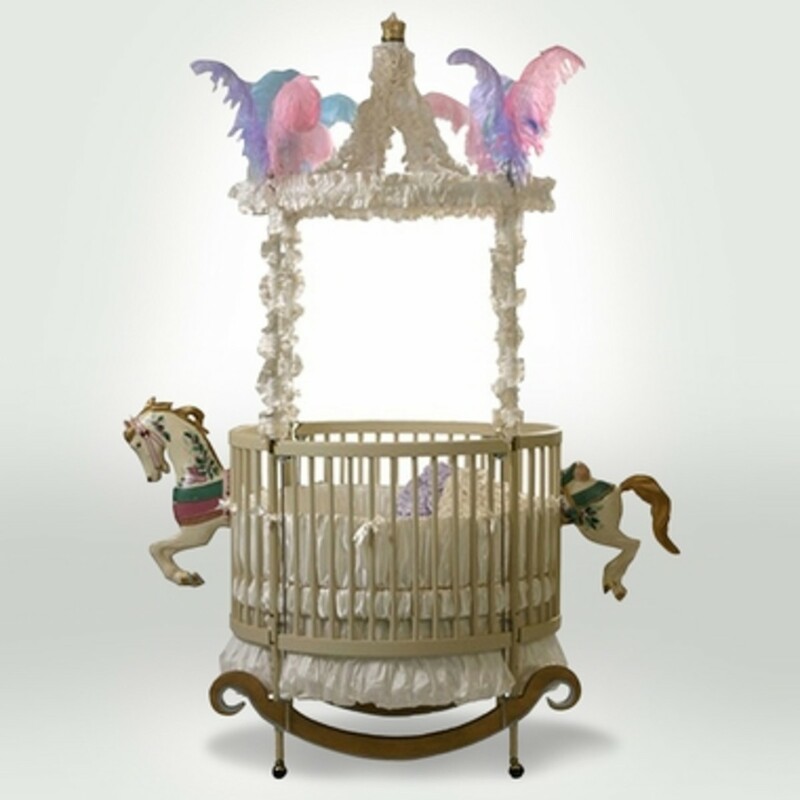 The GuideCraft Noah's Ark Bookcase is a hand-carved, hand-painted Display shelf that will enthrall the kids with Noah's animals marching happily on them.The canvas book display helps keeps in place your child's favorite books. The Guidecraft Safari Book Display is an attractive kids bookshelf with Lions, giraffes and zebras hand painted on the panels.This gives a cheerful look and will also match with your kids safari-themed room.The deep storage pockets in canvas helps keep books organized and in place. 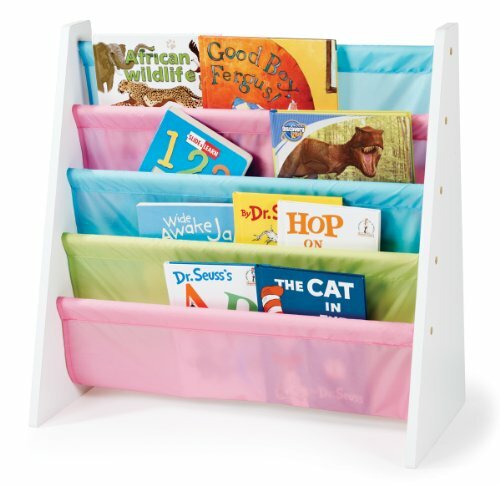 This white sling bookshelf has durable pastel color nylon fabric book pockets that holds books for easy handling by little hands.The pastel sling bookshelf of sturdy wood construction holds books of almost any size and is perfect for the little toddler. A bright red canvas sling makes it easy for the toddlers to keep their favorite books and reach out for them when they need them. This bookcase has a provision for storage of other things at the bottom. Make story-time more fun with this bookcase made with natural wood and fabric. Display books by front or back cover instead of the spine to make story time fun time for the young reader. The canvas sling bookshelf in pastel colors add a pleasing look to your kids room.Make them special by personalizing with your kids name added to the bookshelf sling. This kid-friendly sling bookshelf has canvas shelves of varying depths that can easily hold books of all sizes and shapes without getting staggered.The storage bins come with dual handles for easy lifting. Let kids easily access their story books with ease from this canvas sling shelves designed with their needs in mind. An interesting feature in this unit is the 2 storage bins at the bottom.Your little darlings can keep their toys and dolls here to take them when it is playtime. Great bookshelves - thanks for sharing! Sling bookshelves are cute and space saving for children's books. Nice lens!